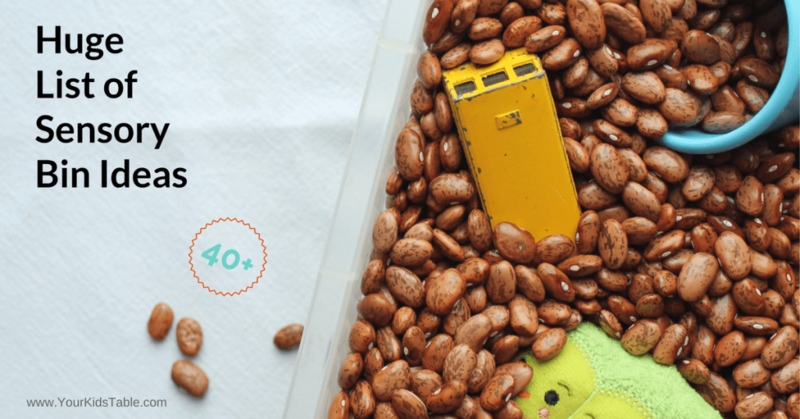 40 plus awesome sensory bin ideas that are perfect for home or school. 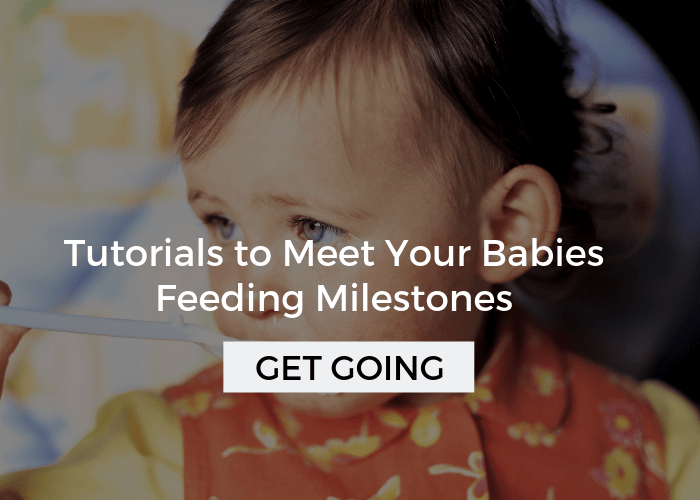 And, get tips to encourage play and benefits of sensory bins. 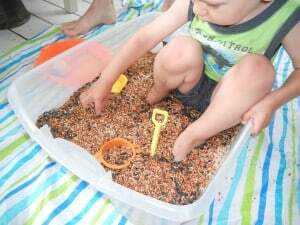 Lots of sensory bin/box ideas are floating around in the blogosphere and pop up on Pinterest from time to time. As an occupational therapist, this is one play idea that I use very often, as most OT’s do, and I kind of am obsessed with them. 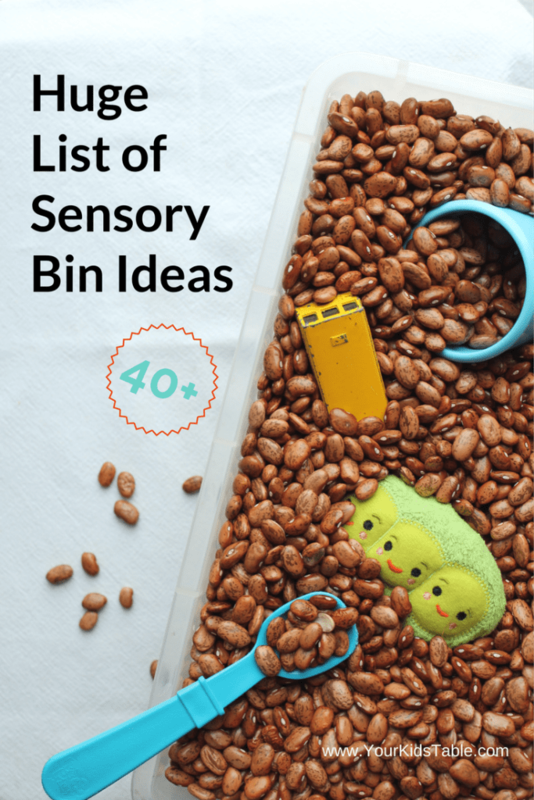 So, I’ve put together a list of over 40 sensory bin ideas to inspire you and encourage your kid to get messy! 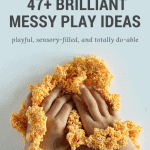 If you’re looking for more messy play outside of a sensory bin head over to the Epic List of Messy Play Ideas! Have I lost anyone? Don’t know what a sensory bin is? A sensory bin is a box or bin, usually a Sterilite container that you fill with some kind of texture like dry rice. Throw in a couple of play toys and voila you have a sensory bin. Easy peazy! 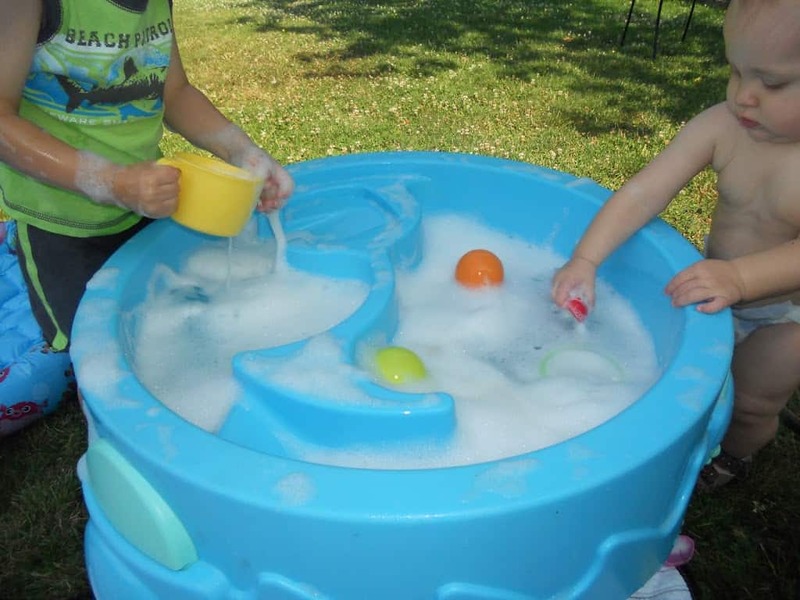 Sensory bins are great for kids because they receive loads of tactile stimulation (read more about the mighy tactile sense) and it encourages imaginative play. On the other hand they are particularly helpful for children that are tactile defensive (experiencing discomfort when touching various textures). Because these bins usually catch the curiosity of a child, they will often push themselves out of their comfort level to explore. 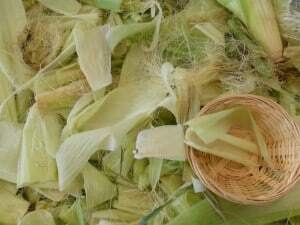 If you suspect that your child may have a limited diet because they don’t like certain textures of food, playing in sensory bins will begin to help desensitize them to various textures and may help them feel more comfortable with the textures they eat (read more about sensory processing and picky eating). Also, sensory bins may be a great activity to include in a sensory diet, depending on the child’s needs. So basically, sensory bins are great for just about every kid! I am sure some of you are cringing at the thought of a bin of dry rice on your living room floor, it can be messy, but your kids are only kids once, so I say go for it! Before you get started with any sensory bin, there are a couple of things you’ll want to keep in mind…. Choking hazards, if your child is still putting everything into their mouth, be mindful of what you are putting into the bin. Many of the ideas listed below can work well for babies and toddlers. But, you can find a list of baby only bins here. Some textures have a shelf life, you may need to recycle or replenish some textures. Never, yes I am saying NEVER, force your kid’s hand into a texture. If they don’t like it or are having a hard time touching it, respect that and don’t force it. Don’t clean up shop though, encourage imitation (from you), and proceed slowly. Maybe they need to use a shovel before they can put their hand in and then maybe it is just a finger. You get the idea. These are usually “easier” for kids to play in, especially kids that don’t like to get messy. They are a great starting point. Assume all items are uncooked/raw. *Please note water beads can be very hazardous for if swallowed. Use with caution. First and foremost let your child explore the bin without any input from you, which will allow their creativity to shine. You could set this up when you need a few minutes to wash up dishes or make a phone call. Of course, you can also sit with them, asking open ended questions. Click here for a great post from Little Stories on this topic. Have cups, scoops, bowls, shovels, serving spoons, dump trucks, and/or ladles in the bin for scooping and dumping. Scooping, dumping, and filling is a great play skill for toddlers, preschoolers can begin to learn some math concepts, and older kids can actually practice measuring and fractions. Draw or write letters with fingers in the different textures by making a smooth surface out of the texture on the bottom of the bin. Actually feeling the texture will reinforce shapes and the way letters are formed in the brain. Get creative with themes or learning concepts. Add artificial or real flowers to coffee (because it looks like dirt) so they can plant them. Or, use diggers and dump trucks to haul away the packing peanuts. Search with closed eyes. Lay some different objects shallow in the texture so that your kid can’t see. Have them search with just their hands and try to figure out what the object is without looking at it. This will help improve their tactile discrimination which will help them master fine-motor skills like handwriting! Get those feet in there! Bury feet and have them explore too, it is such a wonderful sensory experience! If your child is tactile defensive, feet are usually more sensitive than hands, so take it slow if you need to. Throw magnetic letters into the bin and have your kid hunt for them to spell their name or spelling words. I come up with new sensory bin ideas all the time, the list is really endless. I will continue to add anything interesting I think up. Please share any other ideas you have! 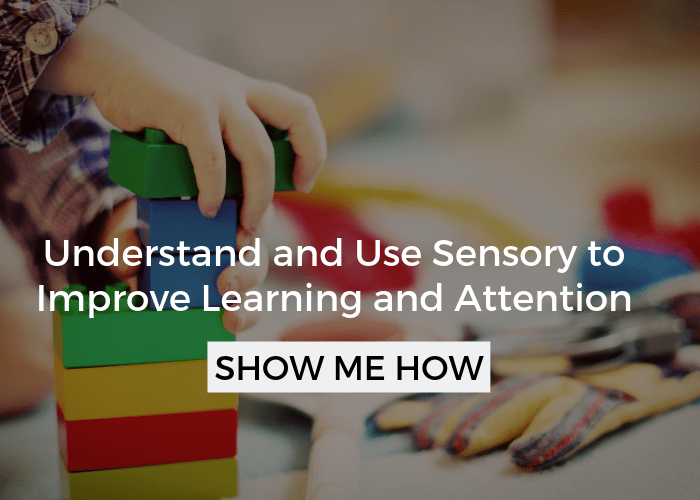 And if you’d like to get inspired with more tactile activities and get tips for tactile defensiveness head to everything you need to know about the tactile system. Follow along on pinterest for even more ideas, I have a whole boat load of sensory ideas and tips there! You might want to get inspiration from this list again! 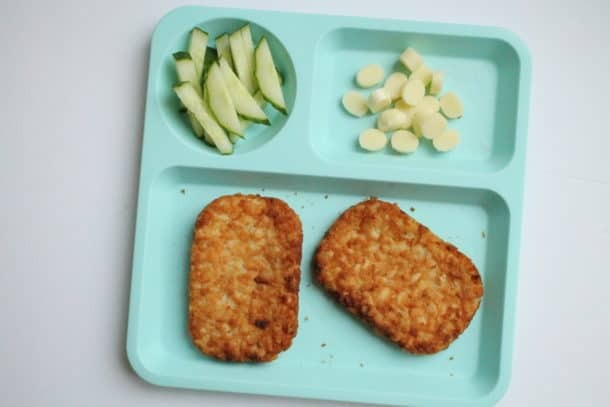 Hi…i just started working with my picky eater and possibly sensory disorder 3 year old daughter…my daughter only eats rice, chicken nuggets, cheerios, and pasta, sometimes cheeseburger, cheese eggs..she looks disgusted when even touching wet fruit, mash potatoes, and even carrots…she also cant stand having dirty hands (with foods, paint, etc she doesnt cry but she holds her hands up in disgust until i coean them, sometimes she will say mommy clean hands, clean hands). So im wondering first of all could my daughter have a-sensory problem?, and if so would she require an OT? These are red flags for sensory difficulties, especially with food. Sensory bins can be extremely powerful when they are used regularly in helping with these sensory sensitivities. It’s hard to say if she definitely needs therapy, but depending on what your insurance covers, it could be well worth having an evaluation. 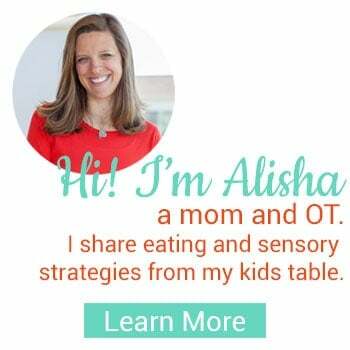 Also, as another option, I teach an in depth picky eating course online that covers sensory issues with food. 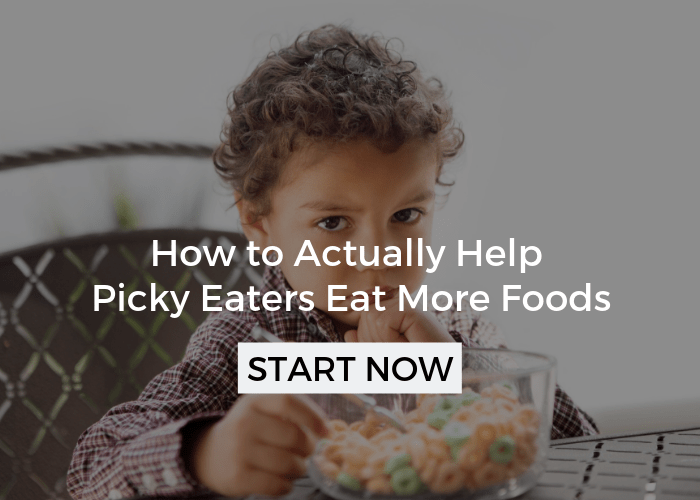 You can learn about it and my 3 best tips for picky eating in my free workshop. I’m sorry, I don’t have a printable made yet, but that’s a great idea! Hi Alisha. 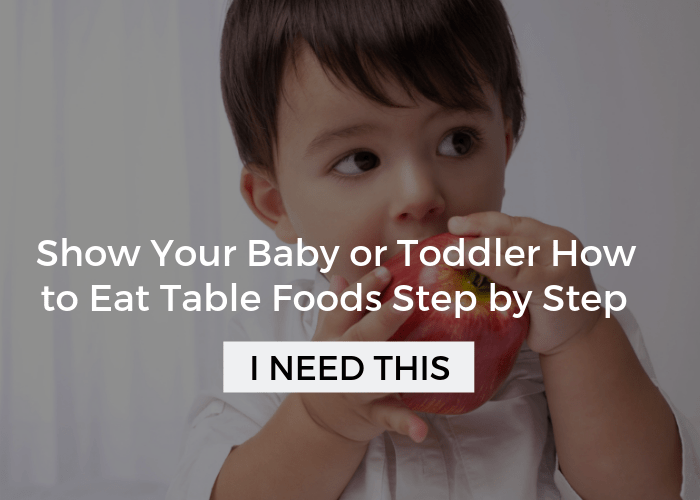 I’m so happy to have found this website in my browsing for help in getting my 16 mth old to try solid foods. Weaning had been quite a challenge. I think i lacked guidance during that stage and so didn’t have much success which has now led to the predicament that we’re in. I’ve made some headway with self feeding fruit, bread, crackers and cheese but besides that, any other food hasn’t been successful. He doesn’t even want to take puree foods with a spoon!!! It’s quite difficult and extremely worrying for me as i’m attempting to prepare him for when he starts daycare/preschool. Before finding this website i wasn’t aware of the importance that sensory play could have and the link it may have to his eating behaviour. He likes to play with dry things like rice, oats and beans but anything moist is a no no. I thought he was probably just scornful. I think Would appreciate any advice you could give. I’d use the play steps in this post to help him with the messy textures, it will take time and keep alternating them like I discussed in the video! You’re doing great! Alisha,thank you so much for your response. It means a lot for me. Unfrotunately I live in England and there is no way I can get a referral from my GP to a feeding clinic. Many health professionals has no knowledge of sensory based feeding problems. So we are on our own. I got one more question I will be obliged if you asnwer me. At the moment what we do is dry rice, kinetic sand, play dough which he is ok with them. He is not comfortable with finger painting but he can tolerate it with being really carefully handling, dry flour, and shaving foam. He came to the stage with foam that I hid little toys in it and he finds it but he is still very careful. What am I doing wrong? Is dry rice and beans the same thing? One type of grains is enough? 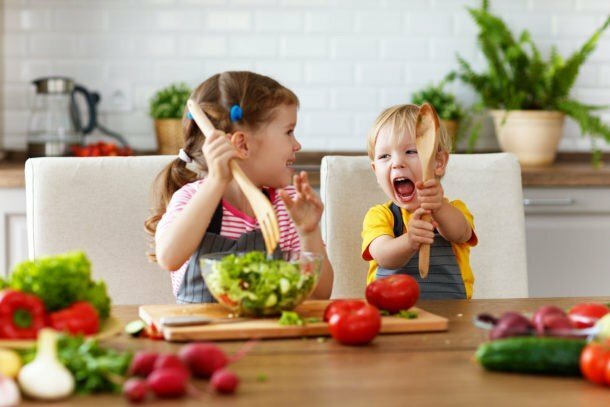 When do kids start eating? When they are really comfortable with all the textures? Even though he made progress with his messy play I havent seen any progress with his eating. 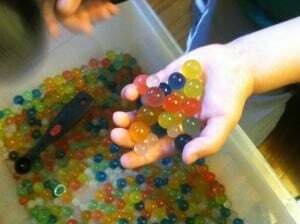 Tapioca balls (boba) can work as edible water beads, if you can afford them. I’m not sure these are great for a group setting as germs could easily be shared. I have a 23-month old girl with Down Syndrome. Is the bin supposed to be big enough for her to climb into/sit in, or just reach in to play? She does not seem bothered by textures but is just hesitant to pick stuff up, especially if it is handed to her, more willing to pick things up by herself. I am excited to try this with her, not something any of her therapists have mentioned. Hi Melanie- you can set it up any way you want, a larger bin provides more sensory stimulation and might be more motivating for a child. However, a small one might be sufficient to start. I would try and hide small toys she likes in the texture and have her put the texture into empty water bottles one at a time and then dump out. All of that is really good for fine motor development! Let me know how it goes! Just made my first two sensory bins tonight. The cheapest and most effective play I’ve seen my son do in a long, long, long time. I did rice with some beach toys (small bucket, sifter, shovel, etc) and dry pinto beans with measuring cups and spoons. He has been playing at the kitchen table with this bin for almost 2 hours. this is unheard of with my son. I have seen the idea to use loose puzzle pieces in a sensory bin. What do you think would be an appropriate toy to go along with the puzzle pieces? I am at a loss at the moment. So sorry that I just saw this! These bins are amazing and kids really do love them, so glad it has been a help to you. I say throw anything in there, it doesn’t have to make sense! oh I tie knots on ribbons to a hair tie and make bows she loves to unravel and play peekaboo. Thanks for sharing- awesome ideas!!! I’ve been lurking for a while now. I have no words to tell you how much you’ve helped me and my 17 month old son. I’ve cried tears of joy and relief. Thank you so, so much. Can’t tell you how much it means for me to hear that. Thank YOU! 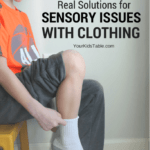 I love these ideas and really think they will help my son with his sensory issues. I want to do these the right way, and how long does he practice or play with each bin–days, weeks? He will not touch “wet” or soft foods to put in his mouth. If he does not have issues with harder foods like crackers, toast should I still have him play with those types of bins? He is 11 moths old right now. P.S. thanks for your help with the straw/sippy cup! Julie, there is no exact formula. Dry bins are a good place to start because they are less intense and they still give really good sensory feedback. However, with him only being 11 months old, I’m assuming he will try to put whatever you have in the bin, in his mouth. So, you may be a little limited there, for now. Experiment with the wet textures, too. As I mentioned in the post, encourage don’t force. Make it as fun as possible. As far as how long… Initially, follow his lead. He may really like it and let him play as long as he wants. If he doesn’t seem interested. Try to engage him by putting fun things into bin that he likes. You could put his blocks, cups, or little people in there. Also, give kitchen utensils because he may be more willing to try with a spoon, but not if he has to put his own hand in. Try for 5 minutes and then move on if he isn’t interested. Keep trying every day or two, trying different games to keep him interested. Most kids love these bins, they are a good idea to have around and pull out from time to time. Since you are working to decrease sensitivity, keep playing with different textures, focusing on the ones that seem to make him uncomfortable. Keep playing with them regularly until he isn’t resistant to fully play in the texture. Does that make sense? Hope it helps! I would love to hear how it all goes! I am a pediatric SLP and I’m new to your blog. I love all your ideas! I work with children ages 0-3 and I’m always looking for new ideas. Thanks for your blog! Thanks so much Simone, I appreciate it, especially from another therapist! Did I totally miss the baby section?? My baby girl is 8 months, I’m a first time mom so I’m just trying to find ways to foster and encourage her ever growing curiosity! I love your blog! Probably not, at the end of the first section I have parenthesis after the last couple of ideas that are totally safe for babies. There are many other’s in the list that are probably ok, but would require close supervision. I will have to revise the post because shaved ice, bubbles, and water are all great for babies too, but I didn’t mention that in the post. Check me out on Pinterest too because I have pinned a lot of interesting sensory play for babies. That is a great idea! I am thinking we may have a “snowy” july sensory bin. Thank you for sharing! 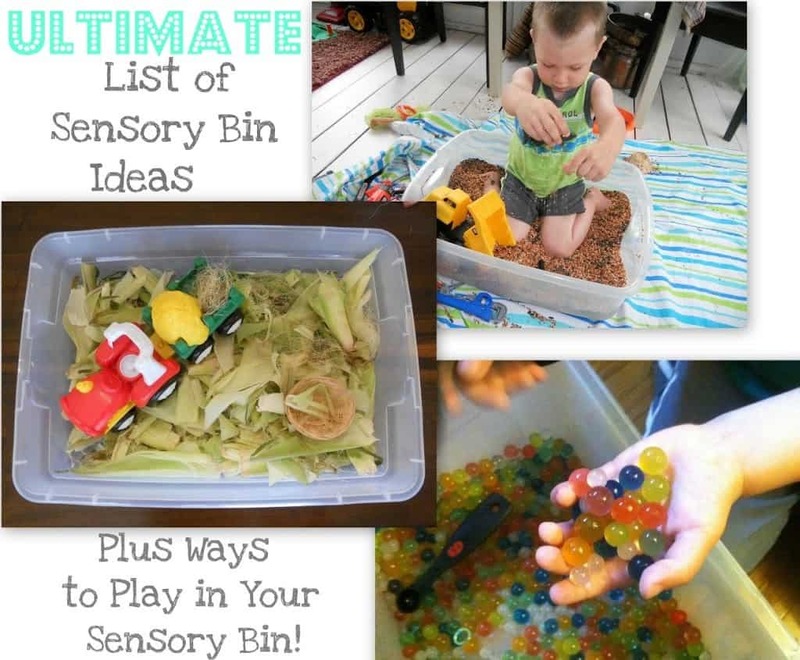 I love this list of sensory bin ideas. Very useful and I will be bookmarking it for future use. I will be featuring it on my weekly Kid’s co-op round up on Friday. That’s great, Brittany! I am so excited to hear that, thanks so much for sharing and for passing it along!